After 8 hours of researching, testing, and repeatedly setting my stomach on fire, Samyang Curry Buldak Bokkeum Myeon is the best spicy chicken instant ramen you can buy today. 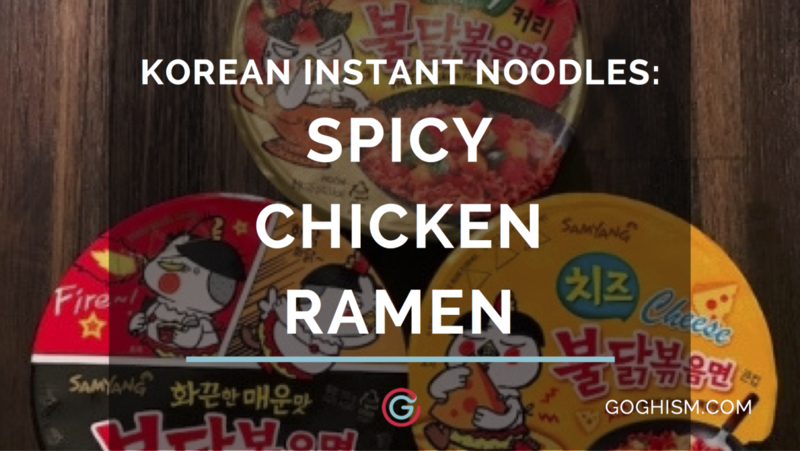 All of the varieties of spicy chicken instant ramen we tested got me sweating nearly instantaneously, but the curry works nicely with the spice to give it a multi-toned flavor that isn’t simply overwhelming you with heat. I was honestly surprised this came out on top. Usually I stick with simpler flavors and shy away from the gimmicky. However, the curry mellowing out some of the spiciness made this slightly more enjoyable to eat. However, do note that it is still really spicy! The curry tasted similar to the Japanese golden curry sauce mix and melded together seamlessly so that I was able to get a nice balance of curry and spice flavor with each bite. In addition, this pack came with an extra side of vegetables, which made me feel great that I was eating healthy for once… I don’t think this is for everyone, but for curry and spicy instant ramen noodle fans out there, this is a marriage we’ve all been waiting for! Easily the spiciest out of the three, I started sweating a few bites in, but I kept going back for more. 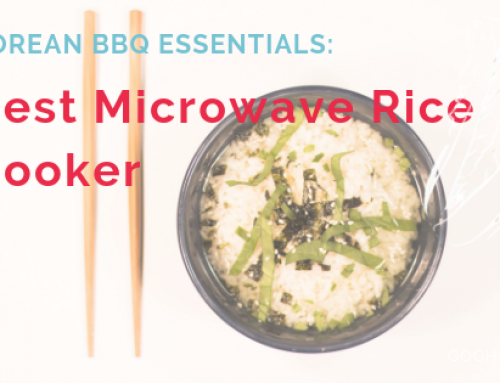 It comes with one sauce packet that coats the noodles in a dark, red, glaze. Your body will know immediately how spicy it’s going to be at first glance. Just like the picture on the packet, a wave of heat will rush over you as soon as this hits your lips. However, after the initial barrage, a pleasant sweetness and tanginess comes through. Be warned, you won’t get an explosion of flavor in your mouth. The original buldak bokkeum myun was meant to be hot. If this isn’t enough spice for you, try out the 2x spicy version. Now before judging why anyone would want to put cheese inside spicy chicken ramen, cheese has actually been really popular in Korean dishes such as jjigaes (stews), rice bowls, pork ribs, and pretty much anything else your heart desires. This version of buldak bokkuem myeon came with two packets, instead of one, with the other packet being powdered cheese. The cheese was definitely not overpowering, much subtler than I thought it would be. You can taste cheese with each bite, but unlike the curry flavored, the spice is still very much the dominant note, which is probably intentional. I know that this is spicy instant ramen noodles, but I probably would have preferred to have an actual slice of cheese melted and stirred into the noodles, giving a more gooey texture. Despite it being my least favorite of the three I would definitely eat this again, and it should peak the curiosity of all cheese lovers out there. Plus, how can you resist not trying it out when you have a picture of an awesome looking chicken sitting on top of a wheel of cheese serenading or just loving the heck out of a slice? 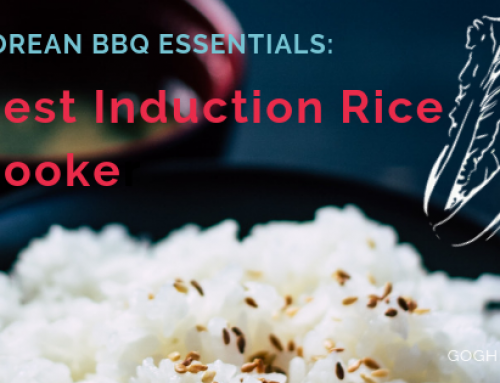 Korean food is known for that signature spicy kick of gochujang and gochugaru, and Korea’s take on instant noodles doesn’t stray far from the tree. I have yet to see a Korean grocery store that isn’t stock full of towers of spicy noodle packages. You can’t even trust the ‘mild’ versions if you’re on the spice averse side. Several years ago I stumbled upon buldak bokkeum myeon (불닭볶음면), which literally translates to ‘fire chicken stir fry noodles’, and it’s definitely a game changer in the spicy instant noodle world. Buldak bokkeum myeon is advertised as ramen but doesn’t have any broth. Instead, after boiling the noodles you drain out all the water and stir in the seasoning sauce (similar to a well known friend of mine Chapagetti). No clue why they decided to go with spicy instant chicken ramen, but I’ll just go with the flow so I don’t have to keep on typing out buldak bokkeum myeon. 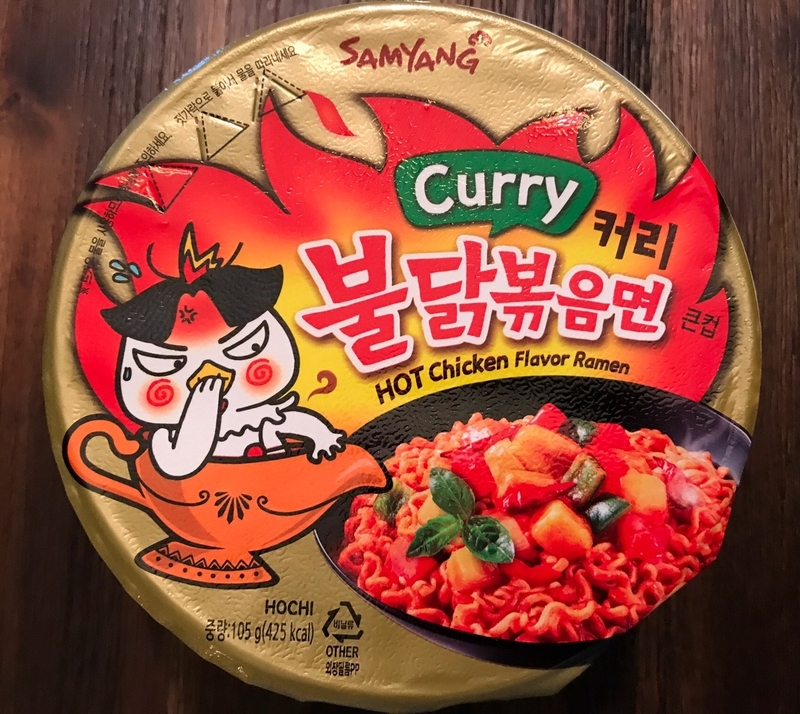 Given its extreme level of spiciness it’s not really surprising that spicy instant chicken ramen got a challenge all of its own a la the Cinnamon Challenge dubbed the “fire noodle challenge” (불닭볶음면 도전). The challenge is to down the entire bowl of noodles without a drink. In 2017 Samyang upped their game and dropped the hek buldak bokkeum myeon (hek = nuclear), which doubles the spice level (8,706 SHU) as opposed to the ‘weaker’ original (4,404 SHU). Any time you go ‘nuclear’ to describe a dish it only means trouble for the next morning. Naturally, of course, the even more mouth firing “nuclear fire noodle challenge” became a thing. I thought I was ok with spice, but let me tell you, this makes me sweat more than a Korean sauna. The spice is tantalizing and addicting, but incredibly painful at the same time. Even my mom, who I’m 99.9% certain doesn’t have any taste buds, gave it her seal of approval. Which reminds me, Jinwoo and Shin, I challenge you to the nuclear fire noodle challenge! 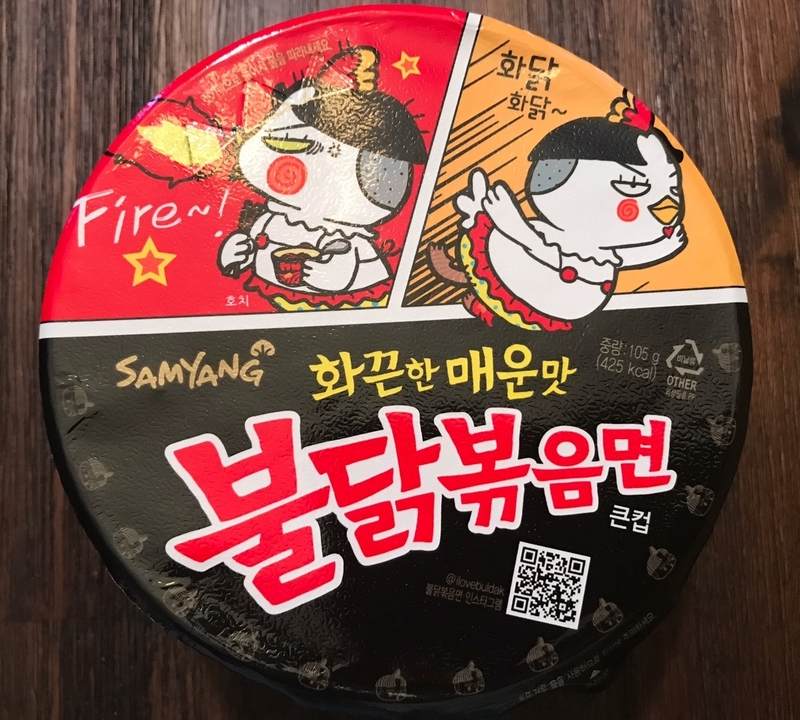 Since Buldak Bokkeum Myeon’s development in 2012, Samyang has created six other varieties that differ in taste but solidified their spicy trademark. We’ve pit three: the original, curry, and cheese to see which one of these red headed step children stand out. We’ll be basing this on: spice level, balance of flavors, complexity of flavors, and the overall texture of the sauce and noodles. I cooked each pack per instruction, nothing was excluded, and no outside ingredients were added. The noodles were all eaten 20 minutes after cooking was completed. 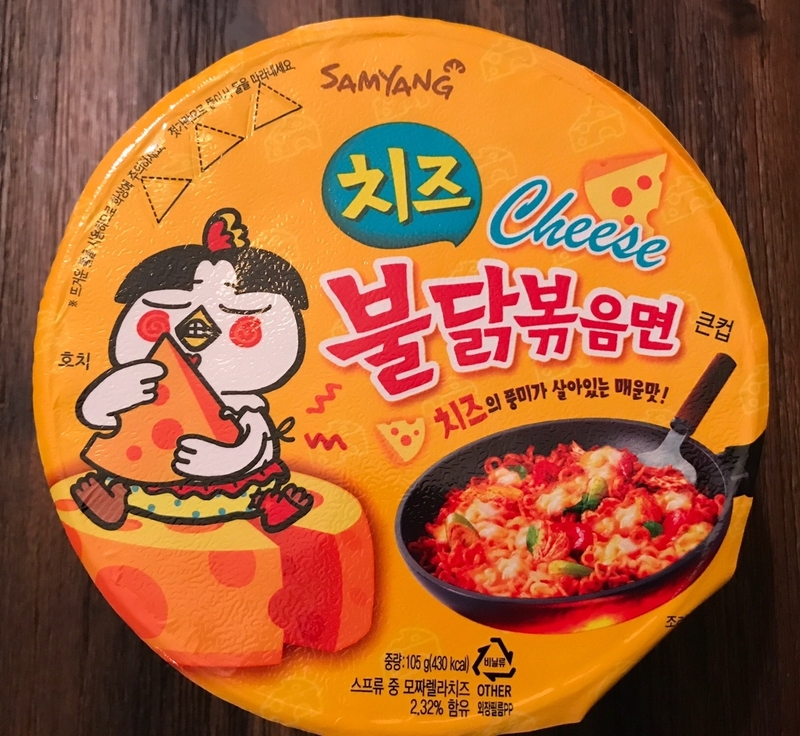 I’m definitely interested in trying out what else Samyang comes out with, so I’ll continue to update this list! Or maybe I should be evil and make Jinwoo be my second taste tester (his sweating is on another level). As always, please feel free to leave any comments or recommendations on any other flavors that you would like for us to try out. There’s something about painfully spicy anything that keeps bringing me back even with full knowledge of the aftermath to come. My wife constantly questions why I do this to myself, but I can’t help it… I just really like spicy things. I’m thrilled to have found that buldak bokkem myeon really comes as spicy or even more spicy than advertised. I’m even more thrilled that it has become a way for millions of people around the world to connect in a way that only food does best — speaking in a way that really knows no borders. Food definitely does taste better (or in this case spicier) when people share their experiences with each other.